If you follow me on Instagram, you'll know that I'm a bit of a gym rat and workout fiend. I've always been active and grew up as a soccer player, but over the last few years I've really fallen in love with strength training, high intensity interval training and more recently, spinning! Cute Activewear - I don't know about you, but when I look good, I feel good. And when I don't feel good, I always make a point of changing something in my external environment (my hair, my outfit, my makeup) to change my state of mind. It works like a charm! 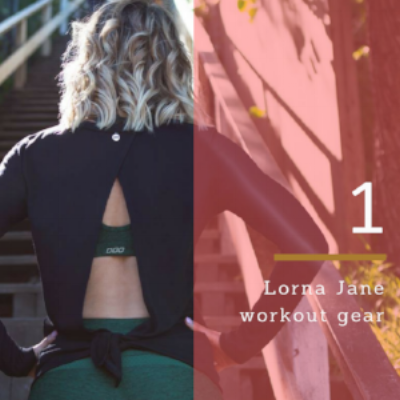 I've been a mega fan of Lorna Jane since I started seeing a bunch of my favourite Aussie bloggers wearing her technical fashionwear and have been waiting in earnest for the brand to come to Canada. If you're in Toronto, you must go up to the Lorna Jane store up at Shops at Don Mills. Tell them Sam sent you! You will not be disappointed, their clothing is fashionable yet functional and I promise you, you'll wear it in and OUT of the gym! Quality Hydration - By now, it's probably common knowledge that staying hydrated while exercising is important because of the added sweat loss (compared to day-to-day activities like working at a desk or watching TV). But WHAT you drink is also as important as simply drinking itself. When we sweat, we lose electrolytes, which are minerals found in the blood that help to regulate (among other things) the amount of water in the body. What I love about Flow Water is not only that it's proudly Canadian, 100% recyclable and BPA-free, but it also contains electrolytes like Mg, Ca, K and has an sourced from alkaline pH of 8.1 to help offset the acidity that comes as a result of exercise and many of the other activities we regularly engage in that make our bodies acidic. Plus, Flow Water is a Certified B Corporation that gives back. Now that mindful hydration. Deep Cleansing - This bar is SUCH a game changer. It's basically a face detox, IMO. The charcoal draws out impurities and oil, brightens skin and helps reduce acne. ALL of which are problems of mine so I can share from personal experience! And because I'm someone who sweats a LOT (I got hard, what can I say), I really want to make sure I properly cleanse my skin to avoid any breakouts. And not only that, the green tea is an amazing active ingredient that reduces inflammation, and the charcoal binds to impurities. This bar is perfectly formulated to cleanse without stripping. For $30 its a steal of a deal for it lasts 6-8 months (when kept dry in-between washes) with 2 washes a day! WHY THIS MATTERS: Soaps are often made with overly drying and irritating surfactants, parabens, and fragrances that can act as hormone-disrupting chemicals. The Charcoal Cleansing Bar is formulated with safer choices like organic sunflower and coconut oils, and pure essential oils. Inspiring Audio - I'm not much of a music aficionado. I listen to whatever is on Top 40 radio and I never know who the artist is of the songs I love to jam to. Unless it's Bruno Mars, MJ, Rihanna or Queen B or Drake, I'm a hopeless case. In any case, I'd much rather listen to an inspiring podcast or a good book while I'm working out. It makes me feel productive and I feel like all the inspiration, business knowhow and self-helpery energizes my workouts. I subscribe to audible and just finished reading (listening to?) Brene Brown's Braving The Wilderness, which you HAVE to read/download/listen to immediately. I also like listening to podcasts like The Life Coach School Podcast, Balanced Bites Podcast, Over It and On With It with Christine Hassler, and of course, my podcast which launches Season 2 in a few short weeks - shameless plug - Your Best Version Podcast. Fancy Feet – I would be remiss if I didn't mention how significantly no show sport socks revolutionized my workouts. Seriously though. No show sport socks are LIFE. Any brand of sock will do (I buy mine at Sport Check and am totally brand agnostic because #salerack), as long as it doesn’t slide down in my shoe and/or climb above the shoe line and into my line of sight. I HATE seeing any bit of my socks while I workout and discovering these no-show socks was a serious #gamechanger. It's the little things, people. What are you workout MUST-HAVES? I'm also on the hunt for a good (read: EFFECTIVE + NON-TOXIC) deodorant because I am a sweaty human but I don't want to smell like a sweaty human. You feel me? Any recommendations from my fellow fit & sweaty sisters would be amazing!